An excellent hiking day, with an exhausting finish over slushy snow. Weather Report: Low 30, High 73. Pleasant during the day--low 50s to upper 60s. Above treeline (11,500') in very cool, with many snowfields, and upper 30s by 8:00pm. 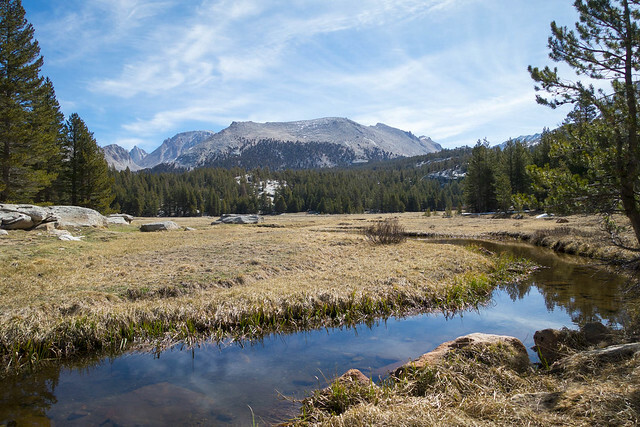 Today was a great hiking day--mild and warm and sunny--and we went through classic High Sierra scenery, meadows and clear snowmelt fed streams and the huge stark granite mountains above treeline. It was mild when I woke up to fetch the bear canister--if you can call (30 degrees, just below freezing) a mild morning. I do now. My body thermostat seems to have reset lower over the past few weeks, and I now think anything over 60 is 'warm' and anything above freezing is 'mild'. We had camped a bit above the flat, thinking the cold air would settle down there, and I strolled down into that cold and took pictures in the bright blue dawn. It was real warm. Joko hadn't woken up yet. He's even more of a late riser on the trail than I am, so I busied myself with sorting out food. Since we were taking another half-day to take it easier on the trail (and our bodies), I was wondering what my rations would be. How many Clif bars a day would I consume, heheh, I asked myself. I settled on four, plus a few extra left over. And the same went with the oatmeal packets--two for each breakfast would be fine, though many days I just wanted to get on the trail and skipped making anything more than coffee before heaading out. All during the day, I thought about food. So many people do so much food planning--menus and calories and special food choices for special dietary considerations, gluten-free and vegan and non-GMO. They might carefully calculate daily calories in a spreadsheet, precisely measuring grams of protein per day, throwing it all in a spreadsheet and ensuring each resupply box contains a proper mix of vitamins and nutrients and calories. I'm not one of those people. I go foraging in my bear canister or OpSak, decide "yep, that's enough for X days, and here's today's fuel" and leave it at that. Eating on the trail for me is about as satisfying and emotional as filling up the car at a gas station. I'm not out here to dose my body with carefully calibrated intakes of vitamins/minerals/electrolytes/calories/. I'm the other extreme, I'm pretty much abusing my body in very un-modern ways. I'm realizing our bodies aren't precise machines. They're adaptable, they're robust, they have hundreds of thousands of years of adaptations built into them. 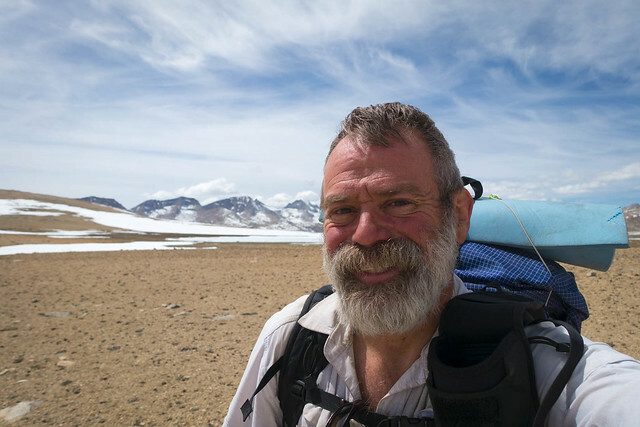 I've been walking every day for six weeks (with some days off now and then), walking over 600 miles, and it feels good, like "this is what humans are meant to do". We humans have been walking for a real long time. We've walked out of Africa to Europe and Asia; we crossed Beringia and populated the Americas by walking. We did all of this without knowing how many grams of protein we needed to eat per day for optimal performance, without knowing what vitamins are, without even knowing how to define protein or carbohydrates or fats. Now, having the modern convenience of so many food choices is a luxury--just look at the breakfast cereal aisle in any American supermarket, or the huge variety of "ancient grains" now in fashion (zero carbs! good fiber! huge protein! but are chia and quinoa really grains or actually nuts? I digress.) My backpacking food is functional: dense in calories, compact, simple to prepare. I eat oatmeal in the morning. I eat Knorr Pasta Sides for dinner, mixed with olive oil. In both the pasta and oatmeal I mix powdered milk (Nestle Nido, yum.) During the day I munch on a lot of mixed nuts (from that 2.5 pound Costco Fancy Mix Nuts). And I eat a lot of Clif bars--in fact, I think every piece of backpacking gear ought to be measured in Clif bars :-) Instant coffee in the morning and cocoa in the evening rounds out my food choices on the trail. So this morning, yep, I get to eat yet another Clif Chunky Peanut Butter Clif Bar for breakfast. Ah well, there's tastier treats down the trail in town. We were both pretty eager to get going, even though we knew today was an "easy" day of just 15 miles. Down in the lower elevations, sure, we'd be done with those miles by mid-afternoon, with a few hours left over to dry our wet tents or air our sleeping bags out. Today's miles were going to be harder, we would be 10,000 feet for the day. 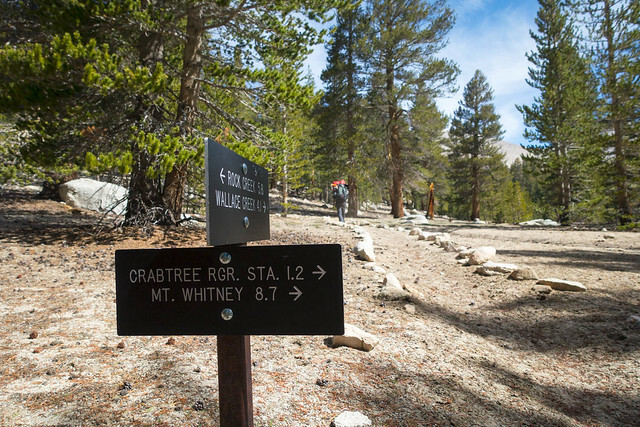 The morning was easy hiking, fast, and we were in Crabtree Meadow on the west side of Mt Whitney by 10 (though we did have to skirt around a few snow drifts covering the trail.) 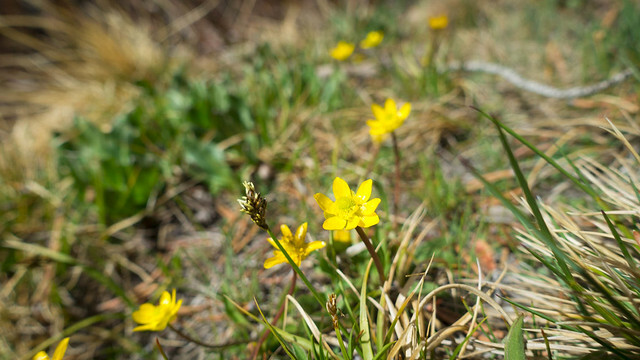 Bright and sunny, green grass shoots appearing, and ranunculus already blooming along the trail. 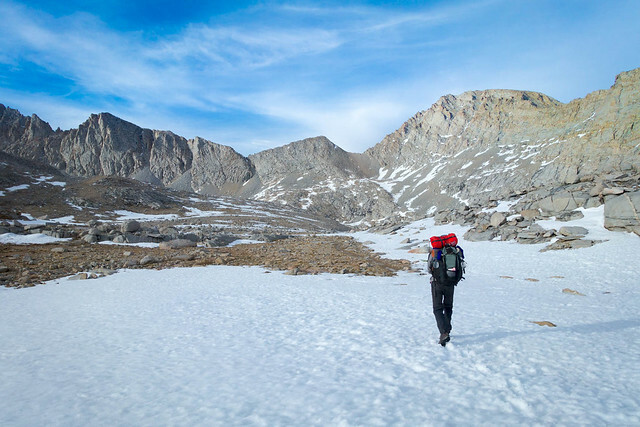 There were great views of the trail up to the summit of Mt Whitney, which looked clear of snow even though this is still April. We'll see if I ever climb up there again. 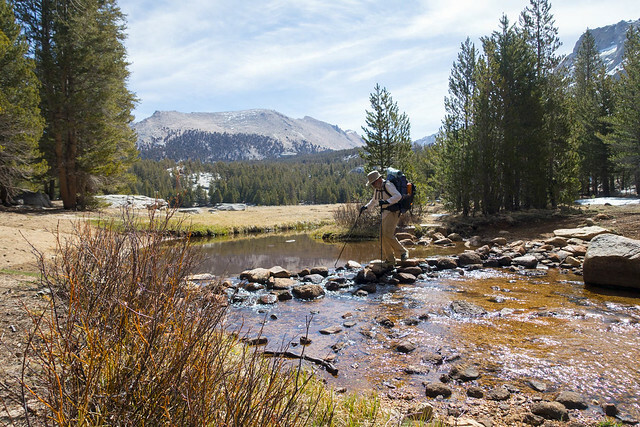 We 'forded' Wallace Creek by stepping on stepping stones, and in early afternoon we briefly went above treeline on the way to Tyndall Creek (mile 774), with expansive views. Leaving Tyndall Creek to the north, we finally left the trees behind, up rounded rocky slopes. 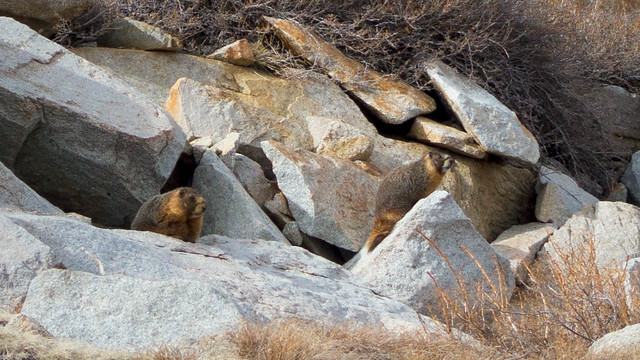 On one of the rocky outcroppings past mile 775, I saw my first marmots. Yay for marmots! They were looking rather well-fed, or maybe they were just super-furry from the long winter, or maybe they'd just woken up from hibernation early with the warm weather and still had a lot of winter fat stored up. They were 30 feet or so off the trail, and scampered away as we approached, but as we just stood silently and stared, they came out to check us out as we checked them out. The next few miles got tougher and tougher. We were ascending up to over 12000 feet, and we could feel it--I was taking stops for a few extra breaths every 100 steps or so. And past mile 775, the trail became more and more covered with large snowfields, until you couldn't see it anymore, or even guess where it was--with the rounded terrain, it could be halfway up the hill, or over near the crest, or on the other side. 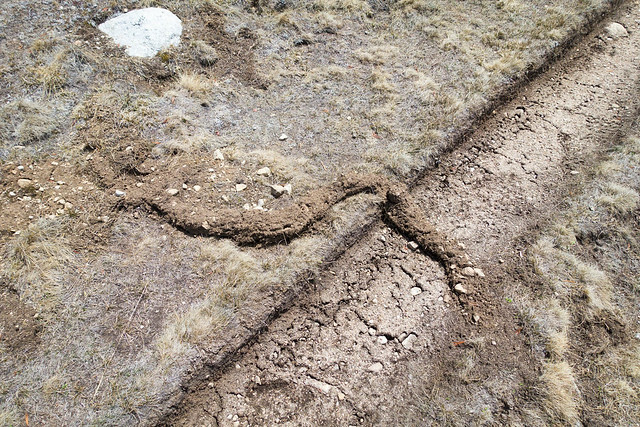 I was real glad I'd loaded the PCT track into my GPS, so we could skirt the snowfields and reconnect, then skirt some more snowfields. We also ended up cutting a lot of those lazy switchbacks, which might be a bit naughty in summer but in this not-quite-winter terrain was fine. I had expected the PCT to be fully clear of snow all the way up to the climb up the Forester Wall to the pass, but I was mistaken. After mile 777, it was mostly snowfield, with small exposed rocky outcroppings. That was tough going. The late afternoon sun had softened the snow, and the snowfields were generally level-to-rolling. This meant walking along exposed rock for a minute or two, plotting the next crossing of snow, hoping you didn't posthole (hah), then walking along more rock. I postholed to my knee several times, blerg, nothing too bad, then postholed my right leg past my waist. The snow was so soft it didn't even freeze around my leg... I splayed on on the snow and my whole body and backpack sunk down six inches, and I shook that leg loose like extracting a spoon from a Slushee, then rolled over and crawled on hands and knees to a nearby rock. I had a second ugly posthole, again with my right leg, but that one was easier and didn't take five minutes to make it to the nice safe rock. I also ended up tweaking my left knee on both postholes; hope it does better tomorrow. 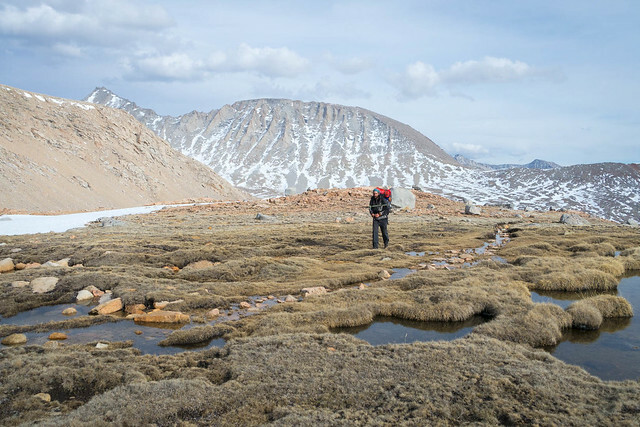 At 6 we made it to the base of Forester Pass, the beginning of the climb up the wall, where Halfmile's maps had promised "several small exposed campsites" near a lakelet. 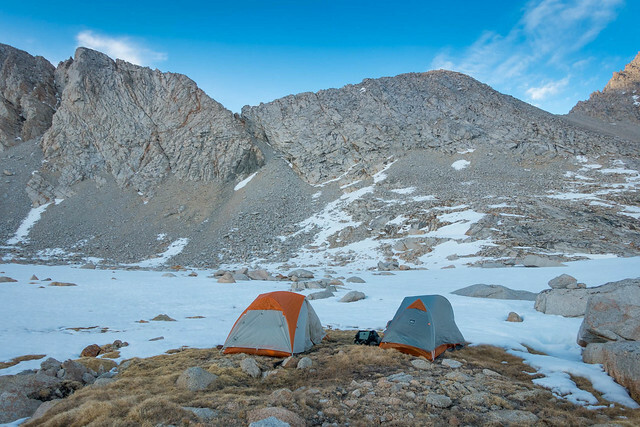 I'm sure they were there, but it was just a sea of snow, and we just decided to camp where we stopped, in a rocky levelish spot of dead grass about half the size of a tennis court. It was the only place we could see that wasn't either exposed boulders or that soft slushy snow. The wind was blowing fiercely from the north; the temperature had dropped to 35, and the sun had hidden iteself behind the western ridgeline. Brrrrr; I was cold and it was pretty difficult to set up the tent without it blowing about. I sealed myself in the tent (after putting the temperature sensor outside), boiled water for my pasta, poured it in my rehydration pot, and blooey, the plastic pot cracked, an inch long crack, with water and flavoring leaking out. Yuck, what a mess to clean up, though I secretly hoped it'd just freeze to the floor so I could fling it out in the morning. No decent pasta for me tonight--so I just put the remainder in my pristine aluminum pot (to this point, only used for heating water) and simmered it for ten minutes; at this altitude of 12,300' it takes a long while to boil water and rehydrate. And what a surprise--it was really good. I nommed another Clif bar for dessert, repositioned the blue foam pads to ward off the cold and spilled pasta juice all over the tent floor, and curled up around the rocks underneath the tent in the fetal position for what promised to be a very cold and windy night.